My sweet B. is the author of this recipe for chocolate milk. She taught it to C. and they make it every day. It doesn't require sweetening – our raw goat milk is plenty sweet. But adjust to your little ones' preferences, perhaps by adding a bit of raw honey. 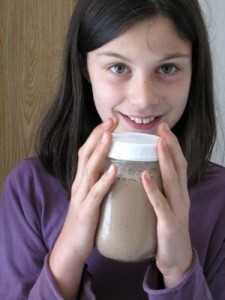 In a pint size jar (2 cups), fill three-quarters full with raw cow or goat milk. Add one tablespoon cocoa powder (or carob powder, which happens to be B. 's and C.'s preference). Secure with tight-fitting lid. Shake it up! Perhaps for 30 seconds to a minute. We just had our first taste of farm-fresh goat milk … it was fantastic! Nothing, nothing, nothing like store-bought goat milk! 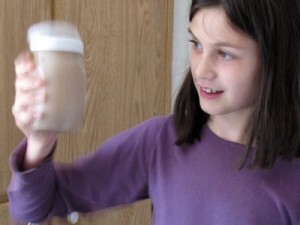 Great idea for getting kids involved making a shake! We do something similar, only I’ve just used a blender thus far. I make raw almond or brazil nut milk and mix with raw agave and raw cacao powder. It tastes like Blue Bunny chocolate milk (in a good way – very chocolatey and sweet). I haven’t tried raw carob, but I’d bet that’d be yummy too. Thanks for reminding me we don’t need electricity to make this – great idea for camping. .-= Faith´s last blog post… A Tribute to Summer =-. We love our goat milk, too. I get a gallon a week and wish I could get more! What a beautiful picture of B. in the last pic. Great idea! We usually put raw cow milk, frozen banana and carob powder in the vitamix, but I really like how they can do this all themselves! Would LOVE to see more kid recipes since every child recipe book I’ve seen is step by step how to make junk food. Just thought of another one we do. We pour blackstrap molasses into raw cow milk and blend. The kids LOVE molasses milk. I don’t see why it wouldn’t work with shaking also. The above paragraph is the first paragraph in an email I sent out today, to all of the owners of blogs whom host “theme days”, that I could find email addresses for. But I could not find an email address on your blog. The rest of the email is what I posted today on our blog. Go to: http://www.xanga.com/thehousethatlovebuilt to read it for yourself.